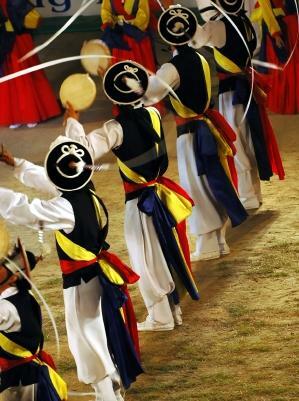 Korean folk dance has survived many wars and active attempts to erase it from history. Today it is kept alive by enthusiasts and fans all over the world in both live and recorded performances. Korea has a history of centuries of conflict, both internal as well as with external powers such as China and Japan. During some of these conflicts, the occupying powers actively tried to suppress the traditional arts, and many esthetic practices including dances were lost. Many artists kept their traditions alive in secret, passing on their knowledge or creating new dances based on the ancient forms. Important dancers such as Choi Seung-Hee, who founded a dance school in North Korea, have been classified as "national treasures" for their roles in preserving Korean dancing. Several dances have been designated as "Important Intangible Cultural Properties of Korea". This classification, originating in 1964, allocates funds and other resources to teach the dances in universities and other schools, as well as to spread the dance culture throughout the world. Traveling groups such as the National Dance Company of Korea bring both traditional dances and modern interpretations all over the world. At the same time, community groups and local schools such as the Korean Dance Academy in L.A. enable anyone, regardless of heritage, to learn to appreciate and perform the various traditional dances. Geommu: The Korean Sword Dance is one of the Important Intangibles. Supposedly coming from a legendary sword-dancer who killed the king of a rival kingdom, the traditional dance was modified by the courtiers of the Joseon Dynasty and is now one of the most popular dances performed. Ganggang sullae: A "maiden's dance", performed in a circle, is another cultural treasure. This dance has shamanic roots of hopes for a good harvest, and was most often danced during the Chuseok holiday. Performed by women, it is traditionally danced at night as the dancers sing and chant to create their own accompaniment. Seungmu: A dance based on Buddhist monks, this dance was banned at one time by the Joseon Court, but is now preserved as one of the Cultural Properties of Korea as well. Seungjeonmu: A two-part dance to promote victory, it combines swords and drums in one dance. The roots of this dance go back several millennia, and paintings of it being performed go back to the first century B.C. It is the 21st Important Intangible Property of Korea. The prevalent element of folk dance costuming is the hanbok, a long jacket with a wide belt and long, flowing sleeves. These come in many different colors depending on the dance and the region, or (in the case of the Monk's dance) pure white. Some dances include long, flowing sleeves and scarves that are integrated into the choreography. Instruments are often included in the dances as both props and accompaniment, such as the "buk" or barrel drum, as well as the metal rings on the "kal", swords used in Geommu. Hats and fans are also common elements, but the focus is usually on the dancers moving in various formations. Korean folk dance continues to evolve through the work of dancers such as Peggy Choy and other contemporary choreographers. They continue the tradition of translating traditional costumes and moves into modern pieces, letting their culture continue to grow without losing the traditions of the past. With the help of the Internet and the spread of the dance throughout the world, the survival of Korean folk dancing is now assured.